In April we travelled through Sicily and I came back with a lot of ideas for Sicilian dishes to cook. Last night my parents came over for dinner, and for the first time since I can’t remember I prepared five all new dishes in a single day. All of them inspired by meals we had in the best restaurants of Sicily. My parents don’t mind being guinea pigs, and although I have thought of some improvements for the next time I make these dishes, all of them came out very tasty if I do say so myself. Since it’s been so long that I’ve blogged about dessert, I’m starting at the end. Cassata is a traditional cake from Italy made with sweetened ricotta, marzipan, candied fruit, and sponge cake (pan di spagna). Cassata can be decorated very elaborately with different kinds of candied fruit and icing, but when we had it for dessert in restaurants in Sicily, we got a single-portion cassatina that was decorated quite simply with a few pieces of candied fruit and icing. Since I had five different dishes to prepare in a single day, I decided to go for the simple option. Perhaps I’ll do a more baroque version in winter with homemade candied fruit and homemade marzipan. Cassata is traditionally made with sheep’s milk ricotta, which is probably hard to obtain if you don’t live in Italy. 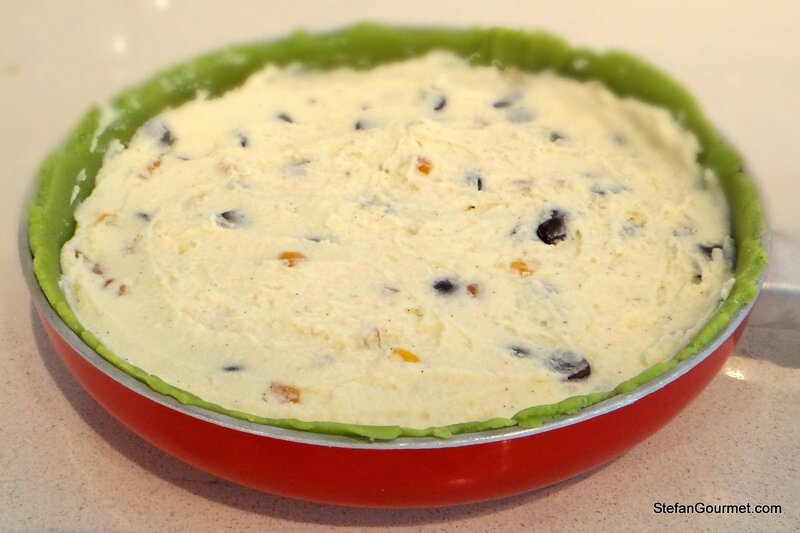 It is quite easy and delicious to make ricotta yourself, and that is what I did for this cassata as well. Perhaps I can find a source for sheep’s milk somewhere, but for now I’ve used generic cow’s milk. 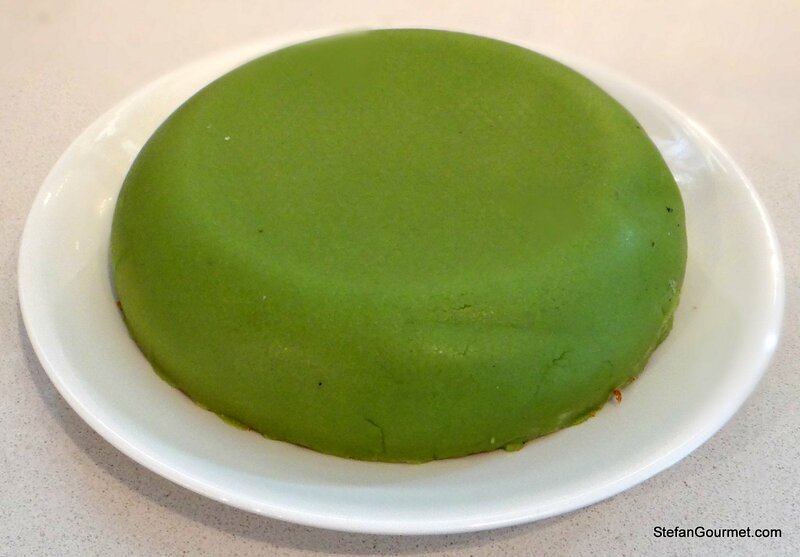 I’ve used good quality store-bought green marzipan. 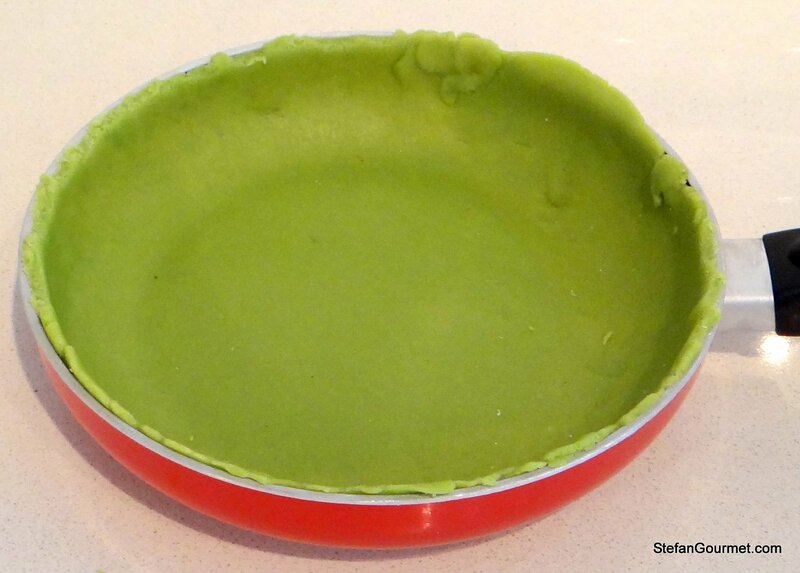 If you can only find white, you can use green food coloring or pistacchio paste to make it green. Pistacchios are the traditional way to arrive at the green color. Start by making the ricotta. 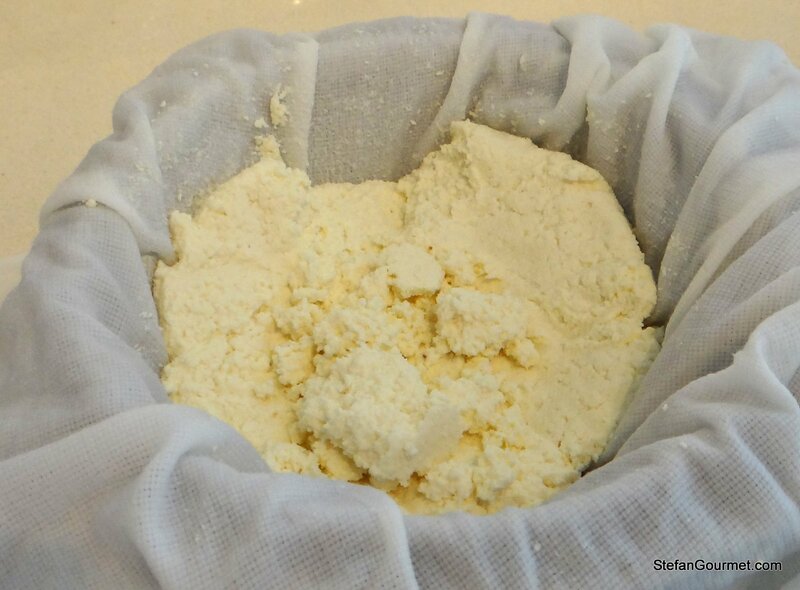 If you use store-bought ricotta, allow it to drain on a cheese cloth or clean dish towel overnight or at least for some hours in the refrigerator. Preheat the oven to 180C/350F (fan off). 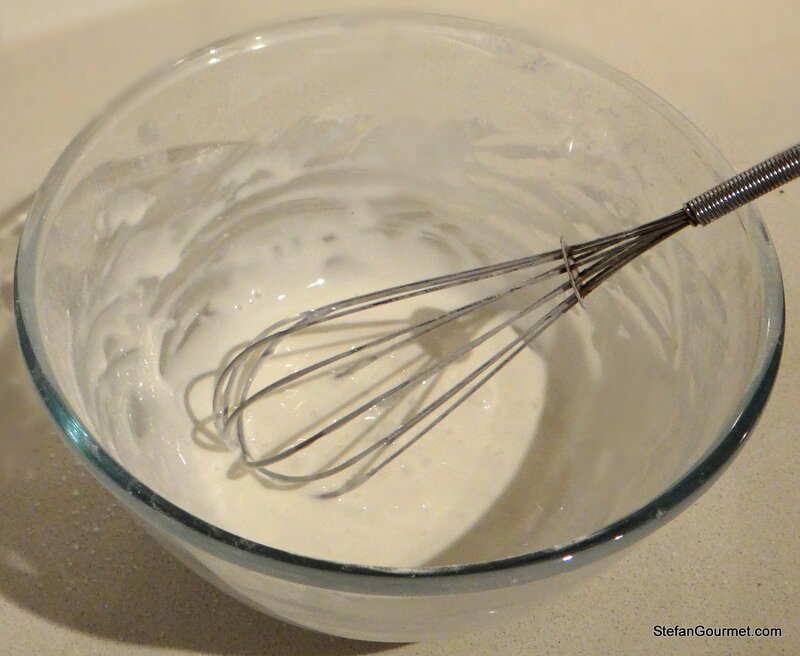 For the sponge cake, put the eggs in the bowl of a stand mixer fitted with the balloon whisk. 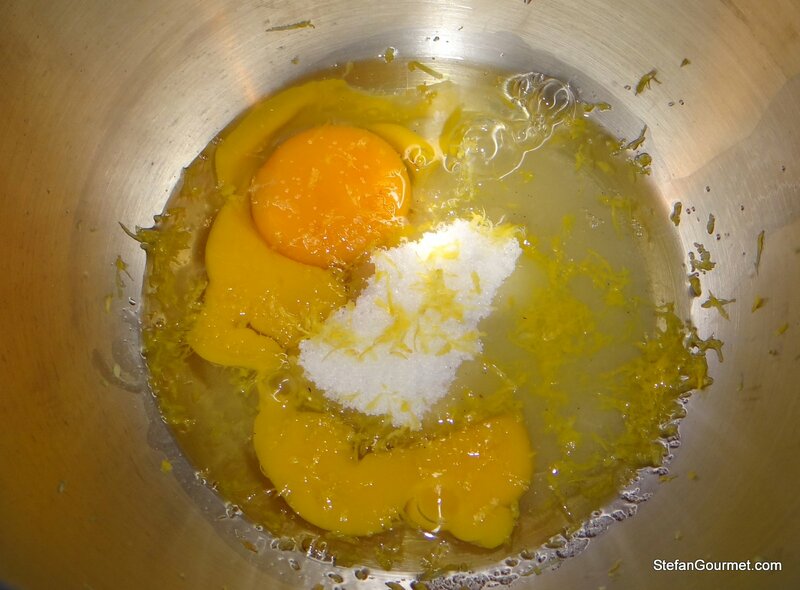 Add the sugar, pinch of salt, and lemon zest. Process on high speed for about 5 minutes until fluffy and creamy. 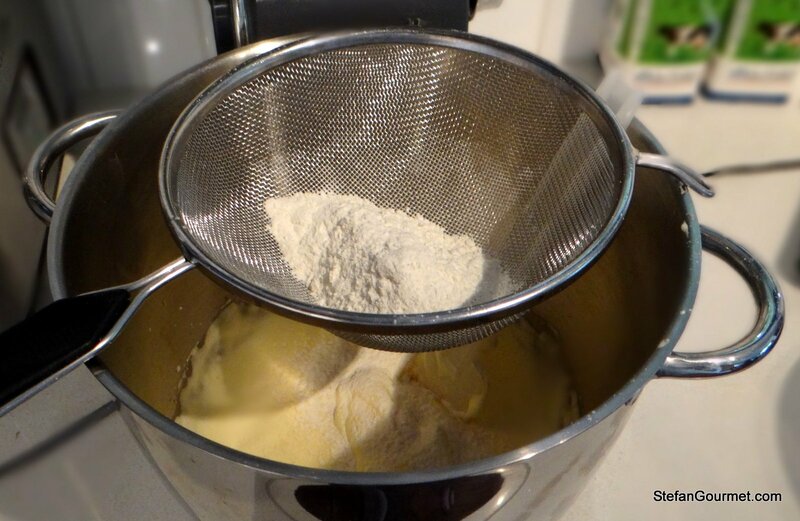 Add the flour and corn starch, sifted. 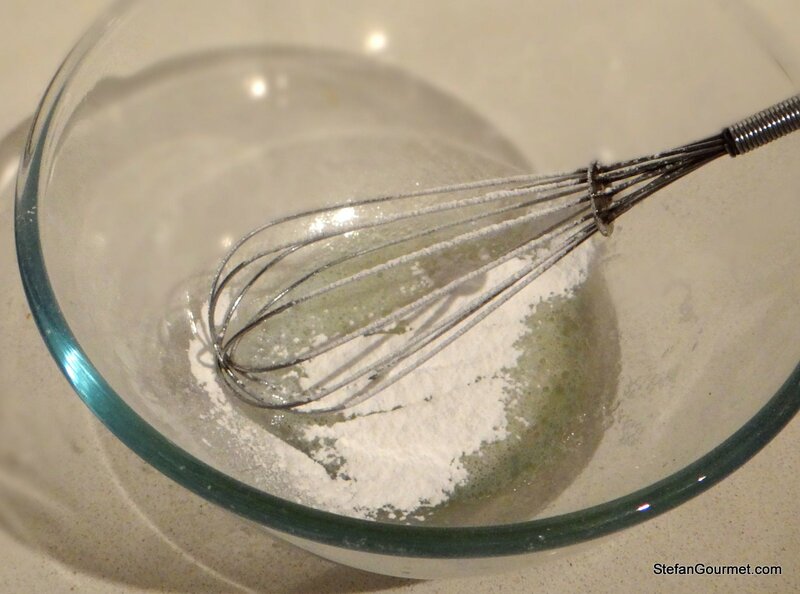 Gently fold the flour into the egg mixture with a rubber spatula, leaving it as airy as possible. 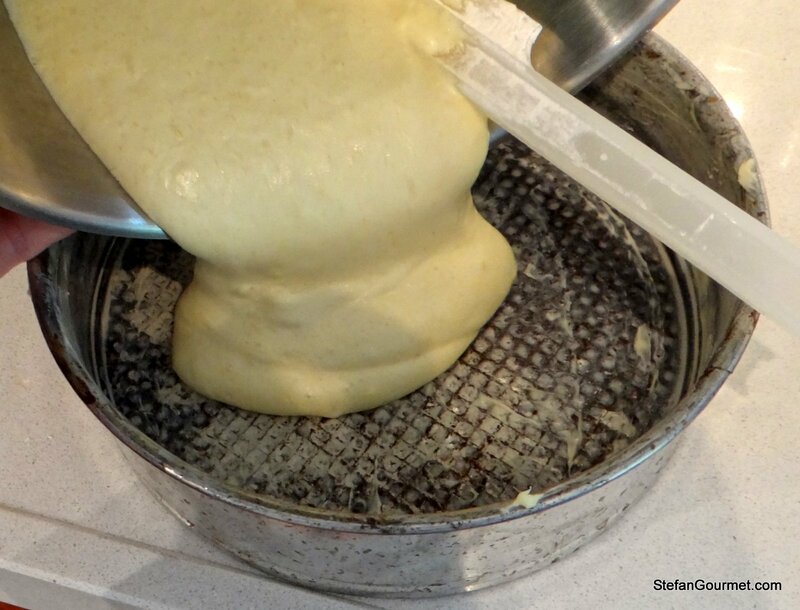 Transfer the batter into a buttered 22 cm (9″) springform pan. Smoothen the top of the batter with a spatula. 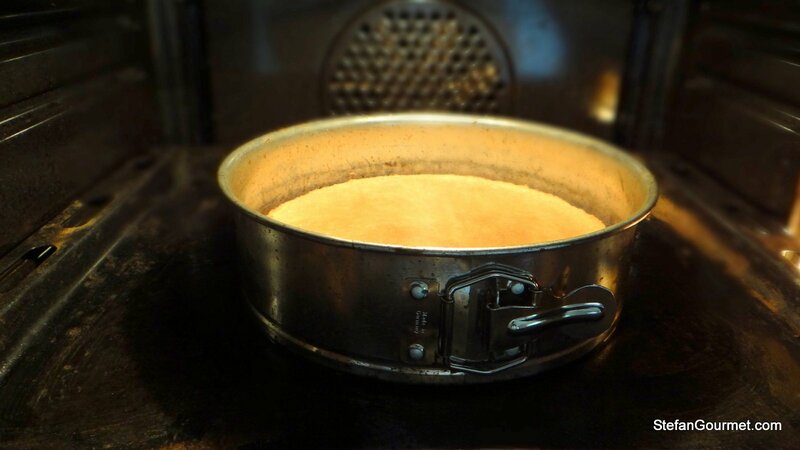 Bake for 20 minutes at 180C/350F (fan off) until a tester inserted in the center comes out clean. 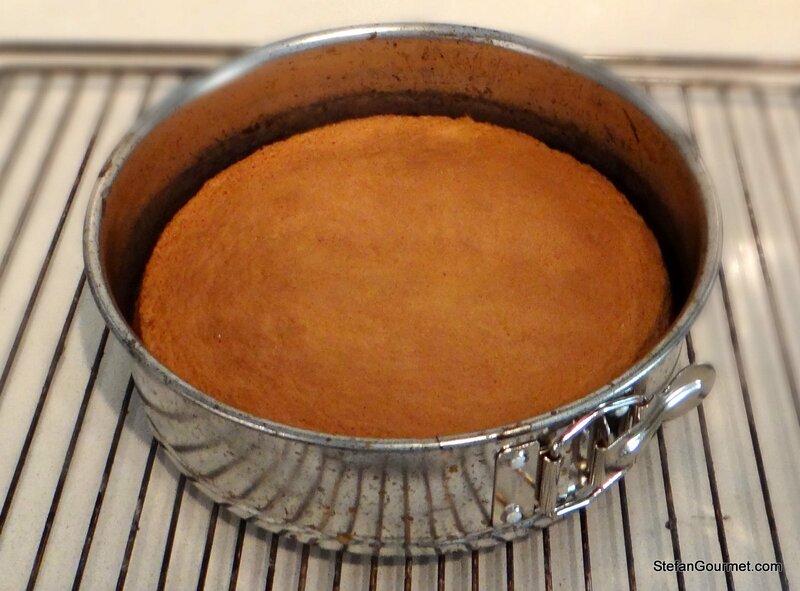 Allow the sponge cake to cool to room temperature. 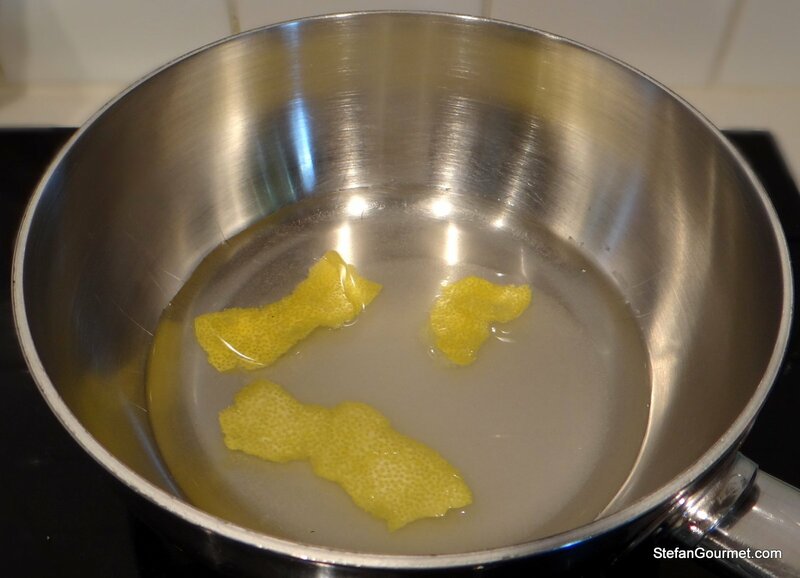 Combine water, sugar, maraschino liqueur, and lemon zest in a small saucepan. 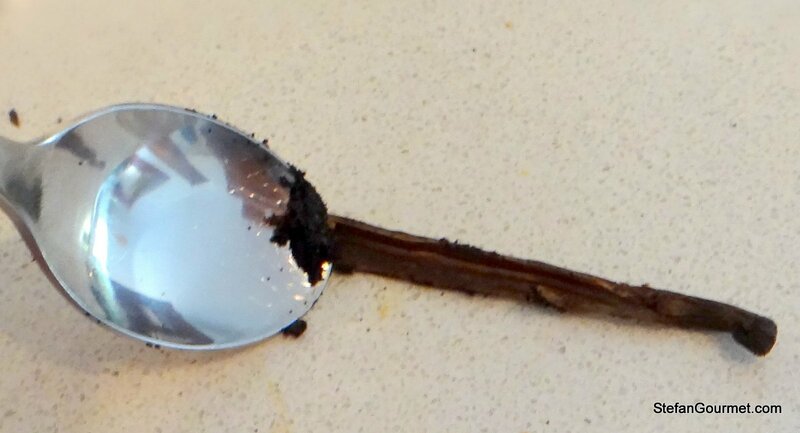 Heat until the sugar dissolves and then turn off the heat and allow the mixture to cool to room temperature. 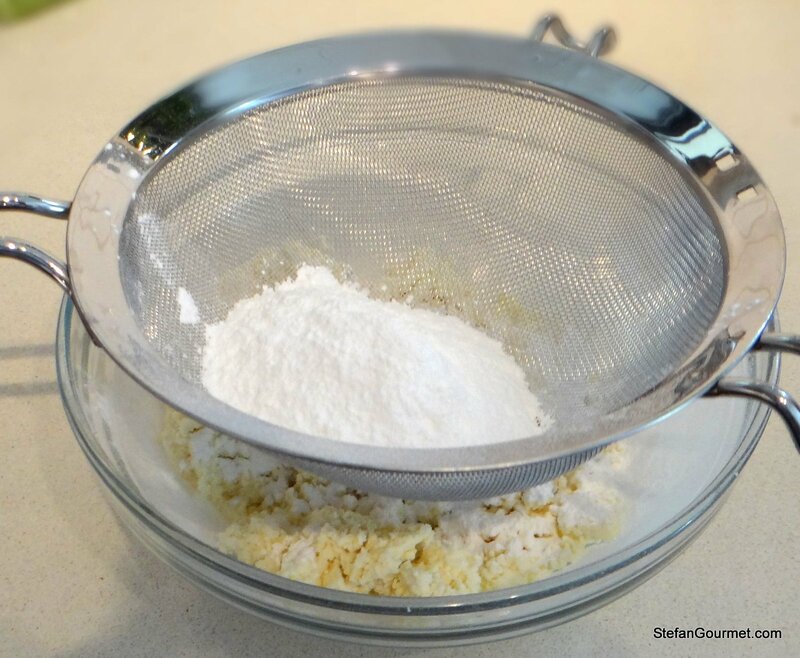 Sieve the confectioners’ sugar before adding it to the ricotta. 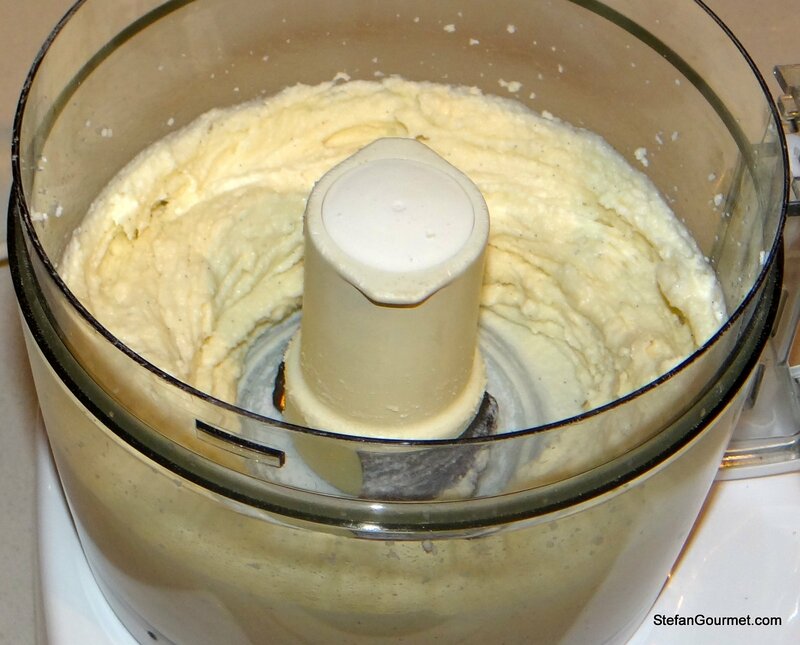 Process the ricotta in the food processor fitted with the metal blade together with the vanilla seeds and confectioners’ sugar to taste until creamy. 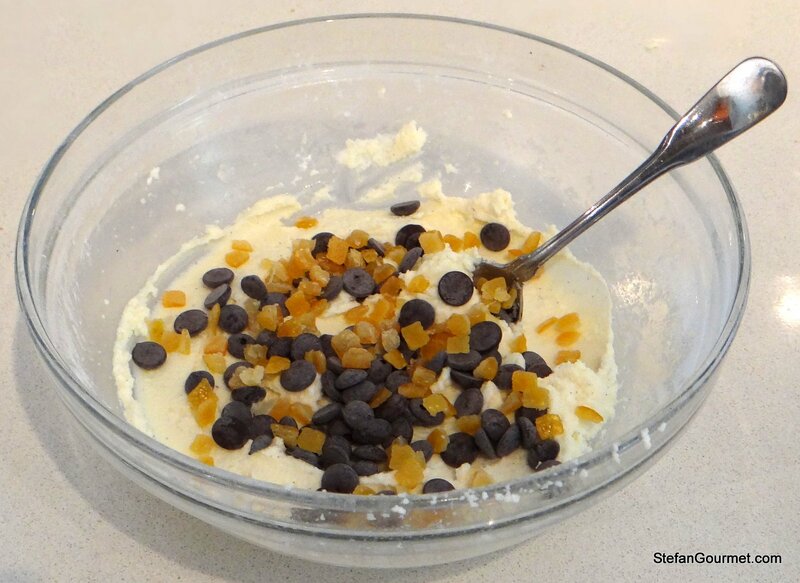 Add the chocolate chips and candied orange to the ricotta mixture. 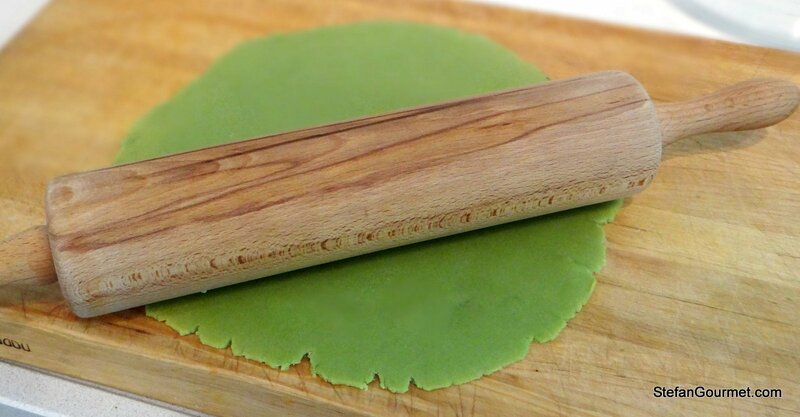 Roll out the marzipan with a rolling pin to a circle with a diameter of approximately 28 cm (11″). 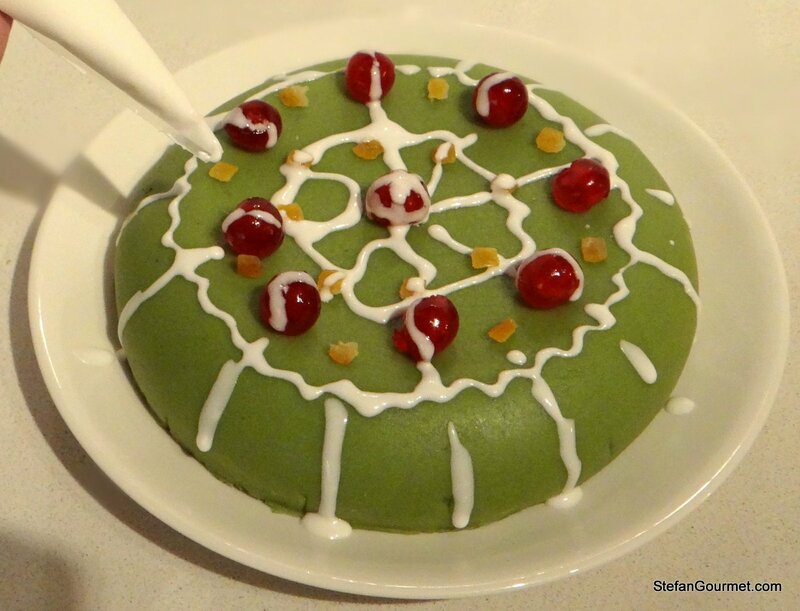 Now you need to find a suitable shape for the cassata. 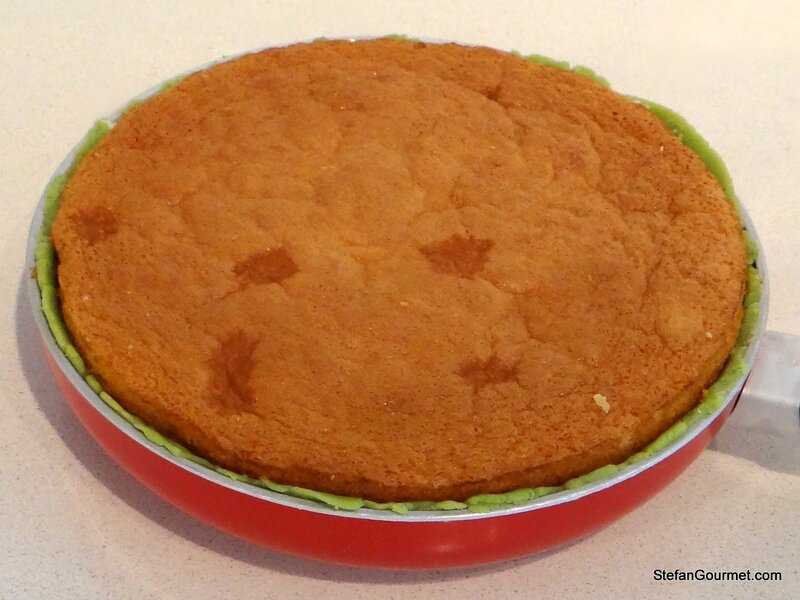 A 22 cm (9″) non-stick frying pan I had lying around was perfect 🙂 For cassata the bottom circle needs to be smaller than the top circle. When you have a found a shape, line it with the marzipan. Cut away any edges that are too big. Like me, you may have to use those leftover pieces to cover up parts where the circle of marzipan just fell short. 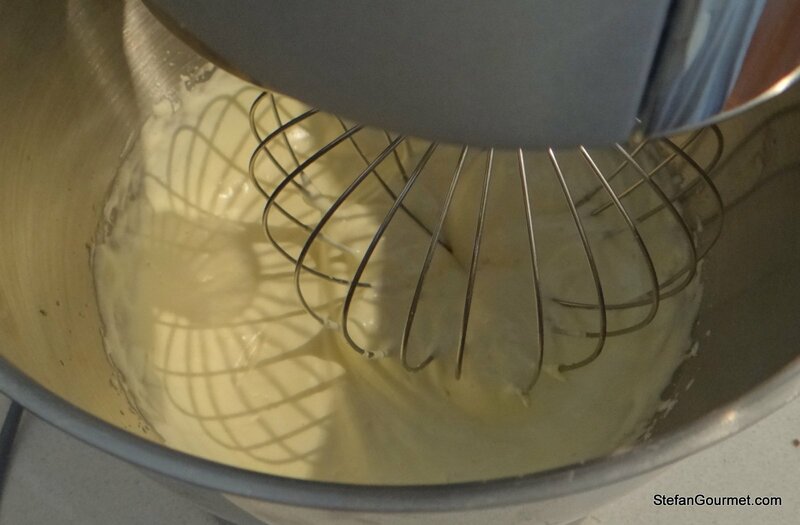 Transfer the ricotta mixture into the shape lined with marzipan, and flatten the top. 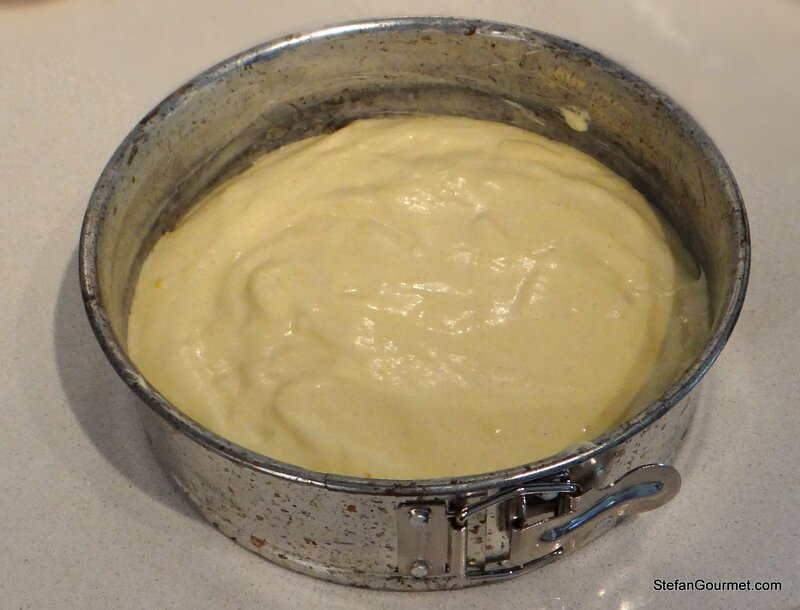 Remove the sponge cake from the springform pan. You may need to use a knife to help matters along. 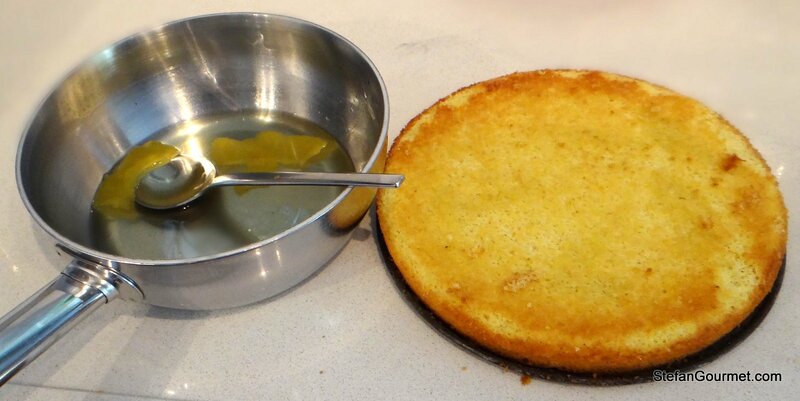 Sprinkle the sponge cake liberally with the maraschino mixture. 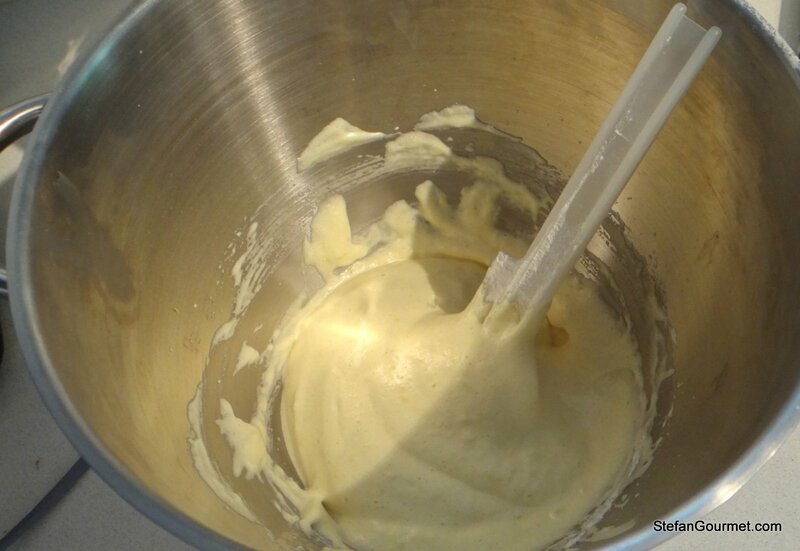 Press the sponge cake onto the ricotta filling. 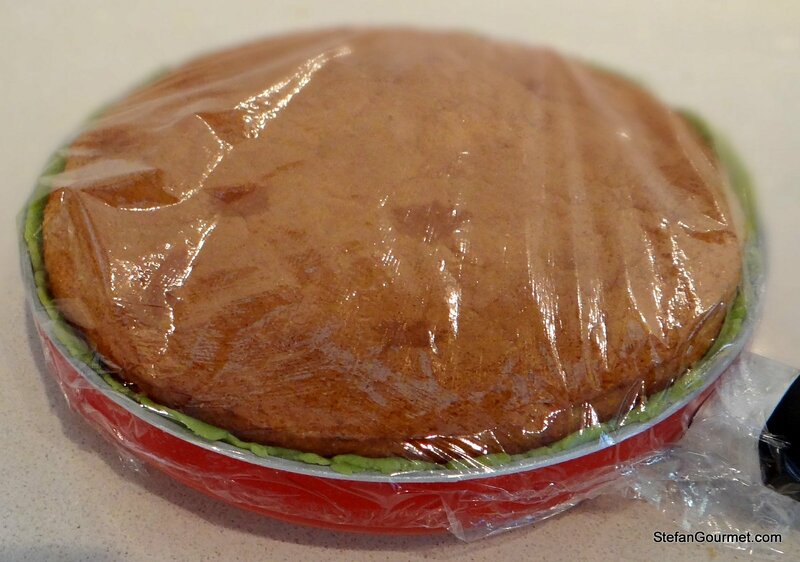 Cover the cake with plastic wrap and refrigerate it to firm up, at least for 2 hours or overnight. 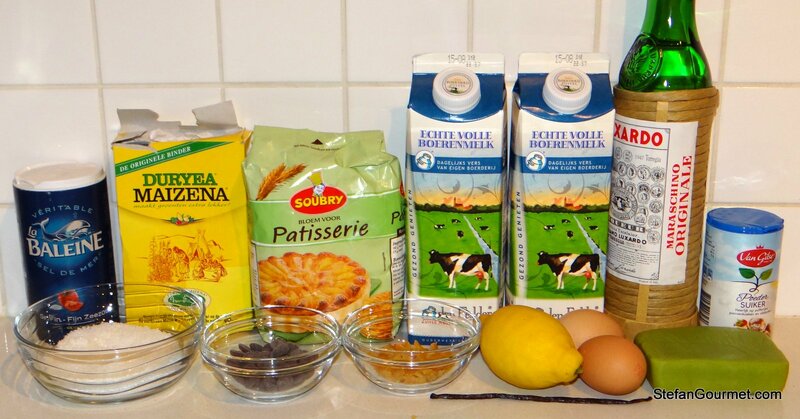 When it’s time to decorate the cake, make a simple glaze by beating the egg white and gradually adding the confectioners’ sugar. The glaze is finished when it’s white and thick. Put the glaze in a piping bag and make a very small opening at the tip of the piping bag. Put a plate on top of the shape and turn it over. 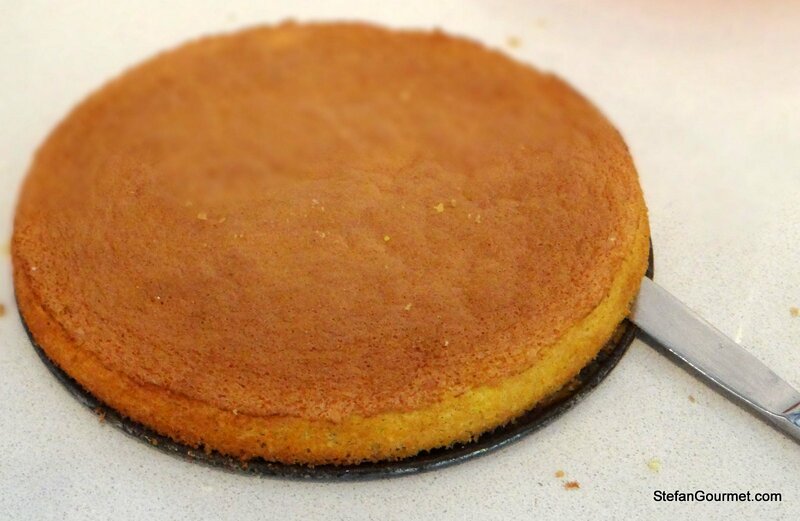 With a little help from a blunt knife you should be able to extract the cake from the shape. Decorate the cake with candied fruit and the glaze. 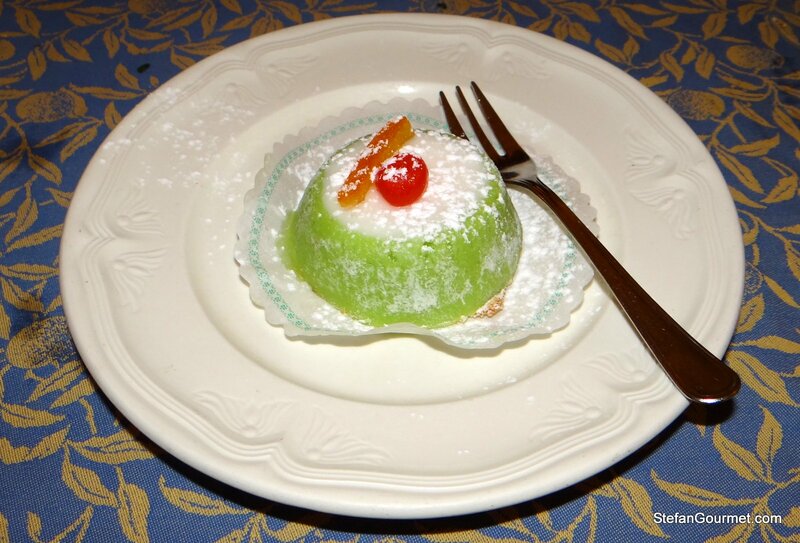 Cassata is usually paired with a passito, a sweet Italian dessert wine made from dried grapes. It needs to be a very sweet passito, as cassata is very sweet. Wow. that is a lot of work. But it looks definitely worth the time! Wish I could taste it! Now I have to find pistachio paste. This i am really going to try, although it seems a lot of work! looks hard but I’ll see if I can make it. Great 🙂 The hardest part may be turning over the cake onto a plate. You could send me an e-mail for other tips. Thanks for the info, Stefan. I sent you my email address via a Facebook message in case you have time to give us a few more ideas concerning our trip to Sicily. Very very good Stefan. 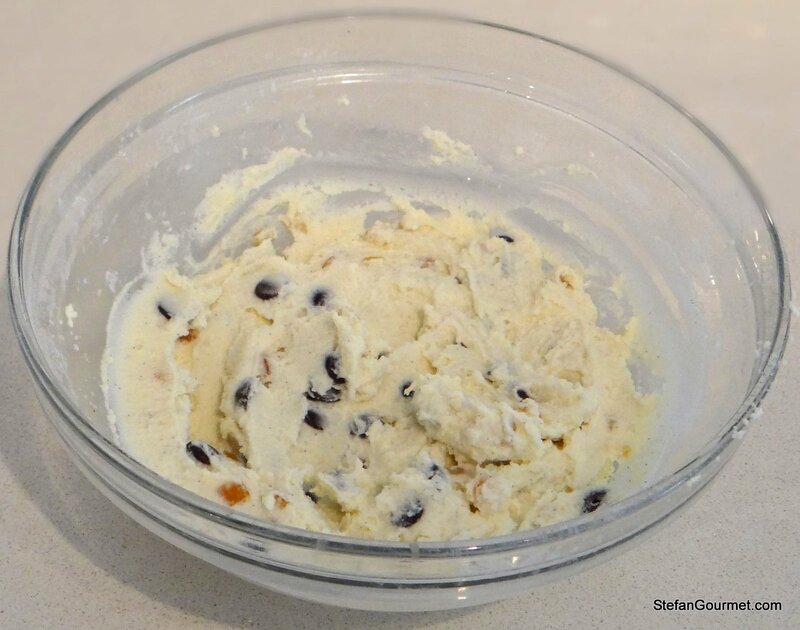 I’m Sicilian and I don’t know how to make Cassata, now I can try. 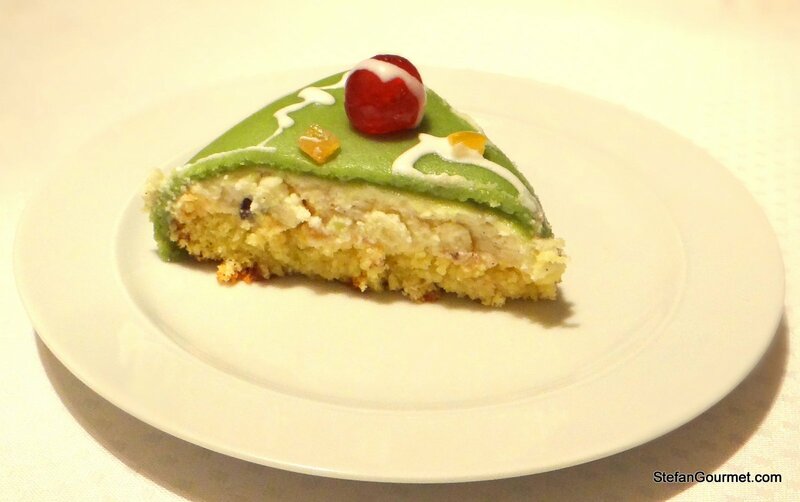 There aren’t many pastry shop that sell Sicilian Cassata cake in the SF Bay Area. There is an Italian bakery in SF which used to make them, but not any more (maybe special order?). Since I learned about this cake and had a piece (only once), I really wanted to know how it is made. Great 🙂 If you can purchase the marzipan and don’t go overboard with the decoration, it isn’t as time consuming as some other cakes I’ve made. 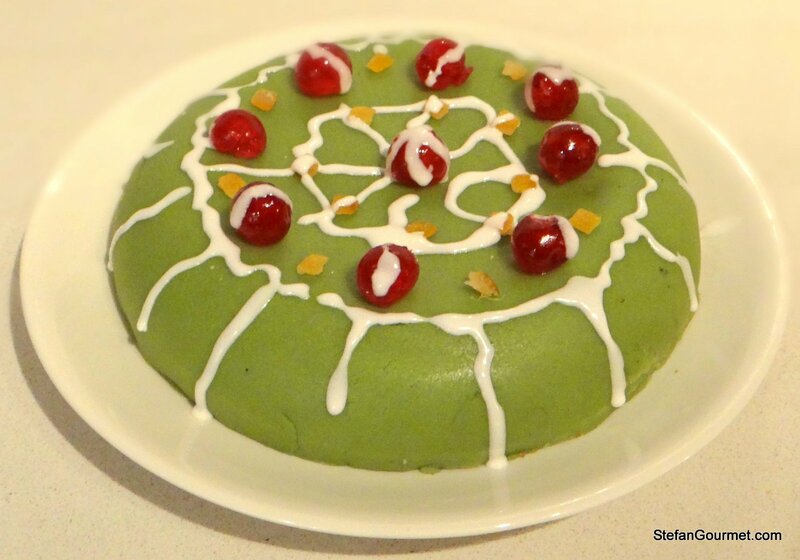 Your Sicilian Cassata looks and sounds delicious Stefan, though bit beyond the camp kitchen! Very good one Stefan. The idea of using the frying pan made me laugh. Love the dessert. It looks both beautiful and very old fashioned at the same time. Not a huge fan of marzipan but that does look amazing!